The Cote d'Emeraude (the Emerald Coast) and the GR34 (Grand Randonnée 34). The Grand Randonnée 34 runs along the north coast of Brittany from Morlais in Finistere, to Mont St. Michel in Ille et Villaine. This path is more than 580km (360 miles) long. So not something to undertake on a weeks holiday. I have, over the years, acheived a good part of it and have loved every minute. Below I have included some of the highlights and hope you will have the time to walk them too. I used a great little book by Alan Castle called "The Brittany Coastal Path" as my guide. 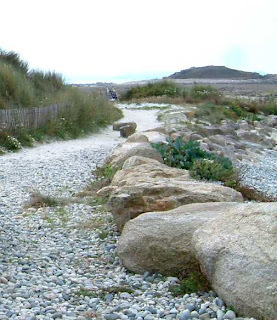 Perros Guirec and the "Cote Granite Rose" (pink granit coast). The drive up to this area will take you about 2 hours. The most popular part of this walk is between the lighthouse at Ploumanac'h and Perros Guirec. The huge pink granit boulders have been softened into sculpted boulders which teter on top of one another. It's irresistable to not climb about. The route is about 10 km but there is not much in the way of refreshements until you arrive in the seaside resort of Perros Guirec. Perros Guirec to Port Blanc. Walking further towards Port Blanc the granit boulders give way to rugged flattened seascape of long sandy beaches speckled with rocks. This part of the coast is off the main tourist drag and feels baren and wild. A seascape I particulary loved. Around the Pointe du Chateau. A friend and I spent a day walking a round trip on this remote peninsula. Not many visitors to Brittany come up to this point but almost all have seen the famous postcard of the little Breton cottage between two boulders (see photo) We started at the "Point du Chateau and walked down the coast and inland to Plougrescant. By the time the reached this tiny village we were ready for lunch and headed to the only restaurant that was open in this quiet village in late September, a Pizzarea. The meal was fab and with full legs we headed back to the "Point du Chateau via Bugueles.